He received his first Nordic Music Prize for the album X/Y in 2012. An album based on electronic. I must say I was a little disappointed when I compared it to the amazing album Headspin from 2004 – an album which was one the most successful in the genre between jazz and electronica ever. The Croatian Goran Kajfes who lives in Sweden has also flashed his talent in the group Oddjob. The latest album draws on the experiences from this group which among other things has played music from Clint Eastwood movies on the album Clint from 2010. On this current album Kajfes has found 8 numbers from the more obscure shelves in the music store. You find Turkish psychedelic funk (Edip Akbayram’s Yakar Inceden Inceden), Swedish progressive rock (Bo Hansson’s Storstad), Nigerian highlife (Celestine Ukwu’s Okwukwe Na Nchekwube) and German psychedelic electronica (Cluster’s Es war einmal). 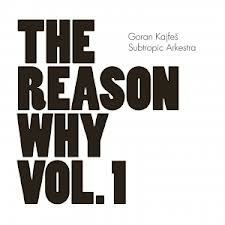 Goran Kajfes has gathered the ten persons Subtropic Arkestra (the identity in name with Sun Ra’s Arkestra is not a coincidence), where important people like Jonas Kullhammar on sax, Per ‘Ruskträsk’ Johansson on sax, Jesper Nordenström on organ, moog and cembalo and Johan Berthling on bass are members. They play tough and spell-binding. There’s a fine line between what’s lose and what’s arranged. Kajfes is directing his troops through the wilderness and the heavy grooves in a most impressive manner. The Reason Why vol. 1 is an amazing and original development of jazz from the 70ies. There is a borderless curiosity in the music. I come to think of some of the things Don Cherry, Art Ensemble of Chicago and Sun Ra did in the 70ies and I strongly recommend this album! It’s a colorful and mind-expanding event in the healthiest way.